It’s true, I’ve probably mentioned this strategy idea 59 times before this post, and some may tire of hearing about it. But I just. can’t. overstate. how much I love using it, several times a week even. 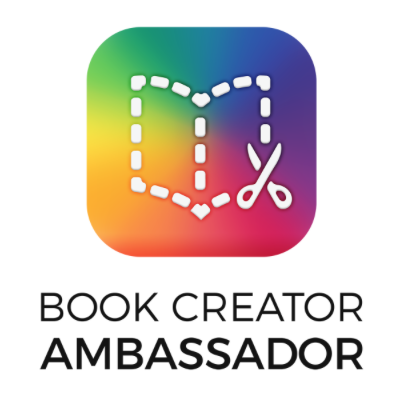 It’s just that I know how difficult it is to convey excitement and magic from one classroom to another by typing words on a screen… I just truly want you to experience it with your kids too. I’m not a fan of giving too many problems for homework (quality over quantity), or the idea of “grading” homework (since homework is an opportunity to practice something new, we are still learning, and many have not yet mastered whatever the homework is about). However, I do like to “spot check” a homework problem or two. Yet, if I am the only one who gets to “spot” the problems, how does that benefit my community of students? Enter Nearpod iOS app. 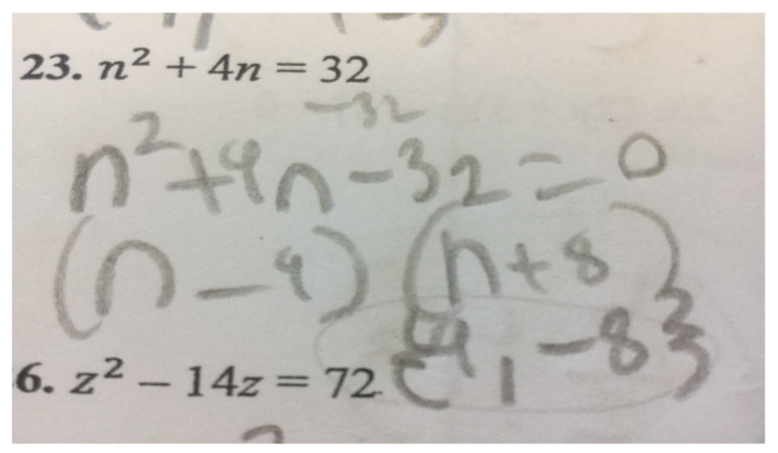 I like to choose one problem from the (paper, handwritten, old-school but good-school) homework that I’m most curious about so we can pick it apart. As students enter class, a Nearpod code is already projected on the screen. While I’m taking attendance, Nearpod is grabbing a work sample from every single student. Each student quickly takes a photo of the problem I’ve chosen ahead of time, and submits it on a blank “Draw” slide. I anonymize the work so we’re focused on the math, not who did it… initially, anyway. 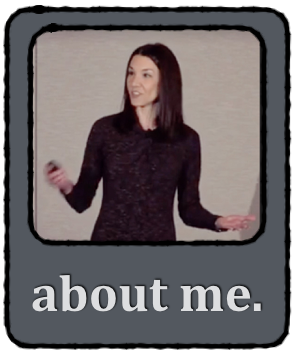 As conversations begin, students inevitably reveal their identities so they have the opportunity to show AND tell about their thinking that’s on the big screen, even if… especially if… it was initially wrong and they want help. My Algebra 1 students are brand new to solving quadratic equations by factoring. No sooner did I project the first sample of student work today than my students literally started pointing at the screen, talking all over one another. Nearpod, I don’t know how you do it, but there’s something about this format that brings out an energy in my students that almost doesn’t make sense. We are looking at equations and we are genuinely, seriously excited to talk about it! Teacher truth-note: If we’ve ever taught this topic before, WE TEACHERS know our students are going to make these errors. BUT THE KIDS DON’T. This is the first time they’re doing this… they’re seeing this. Let them think they are the only group of kids who have ever done this. Give them the privilege of identifying and giving names to the errors they see. 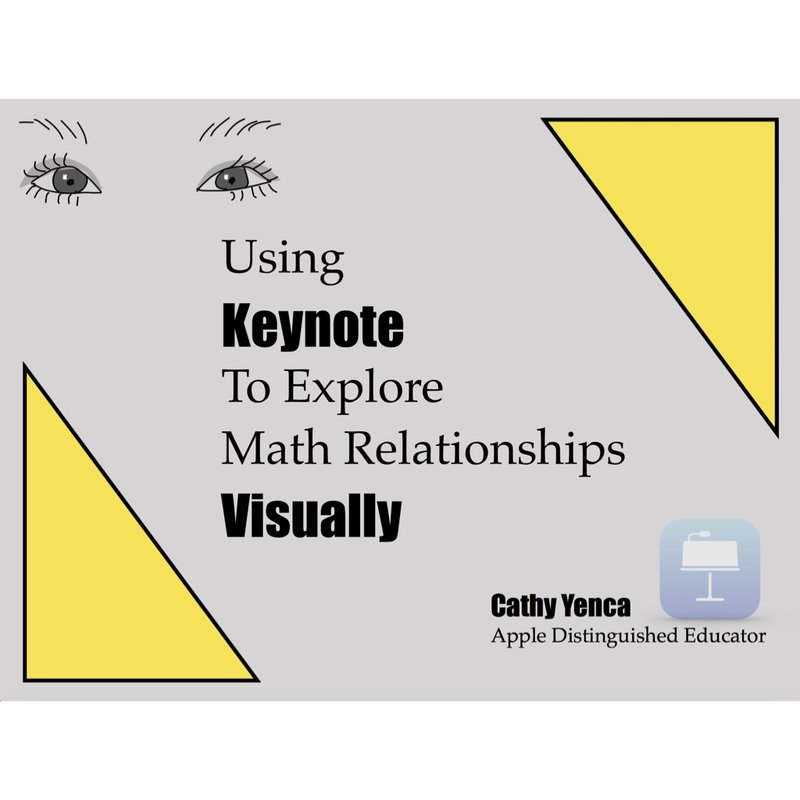 Let their eyes be fresh to the math that we’ve been teaching for years… and maybe, just maybe, some of that math will seem a little fresher to us teachers, too. 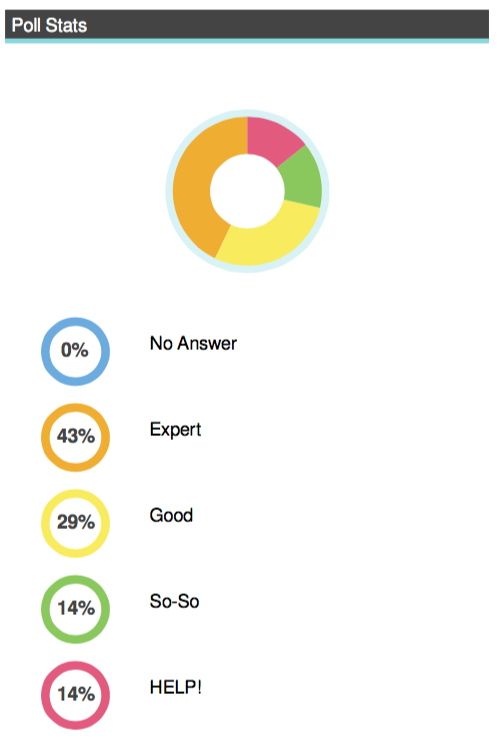 I like to follow-up with a “Poll” after these great conversations, where students rank their current level of understanding. Finally, I give them an “Open Ended” anonymous opportunity to ask questions, in writing, and showcase/address them before we leave Nearpod. Students aren’t shy about sharing their opinions about the benefit of doing this feedback cycle. We often have to do a bit more reteaching once the Nearpod portion has ended, but it’s VERY focused. 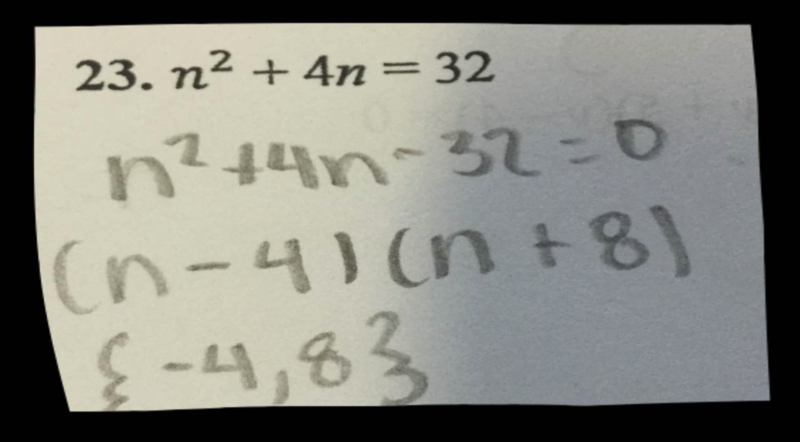 This entry was posted in Algebra 1, Pre-Algebra and tagged iPad, nearpod. Bookmark the permalink. 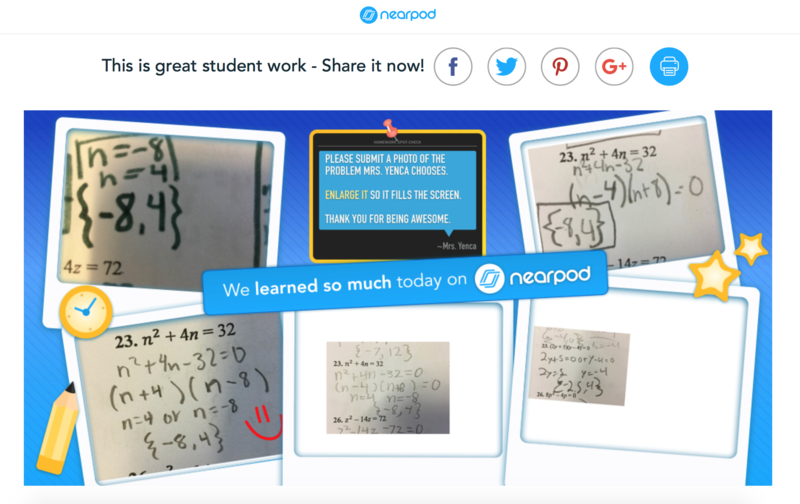 5 Responses to Nearpod iOS –> Draw –> Photo –> Homework Check! Your comment about the students “discovering” their mistakes reminds me of my Alg II Trig and Math Analysis teacher in high school, who would tell us he didn’t know what to do next and… some of us believed him…. and we were all over those derivations. 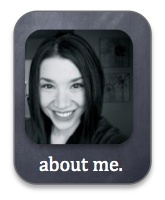 I use nearpod daily and I love it! Do you snap a picture on your iPad and then upload it to a draw it quickly. I am curious about the practical side of doing this. The iOS version of Nearpod has a camera option built in to every “Draw It” slide.